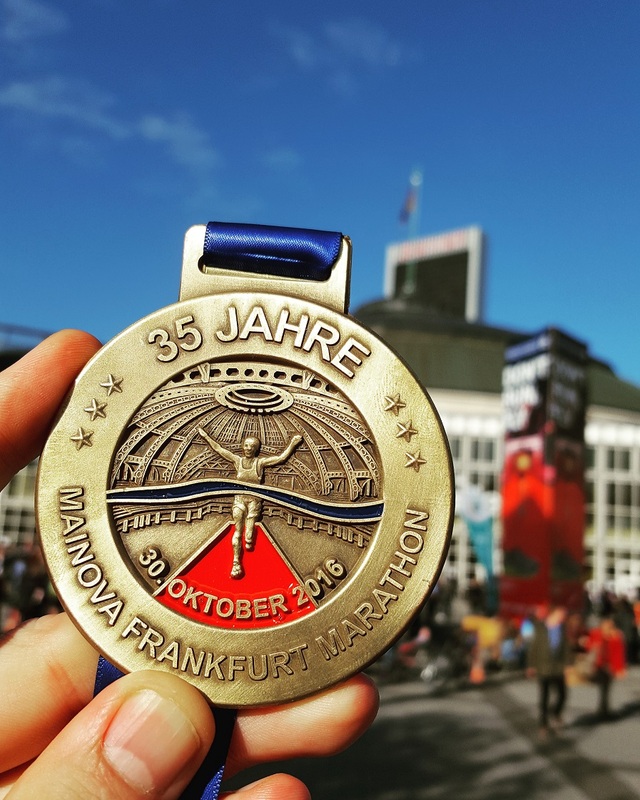 Really, there wasn’t muuuuch more I could have asked for ahead of the Frankfurt Marathon other than maybe a slightly more robust commitment by myself to strength & conditioning, stretching (and maybe a few more high mileage weeks). Oh, and not doing a hideously hard fell race 3 weeks earlier that ruined my confidence up until race day. If you had asked me a month earlier, I was pretty confident that I’d be able to get a PB. 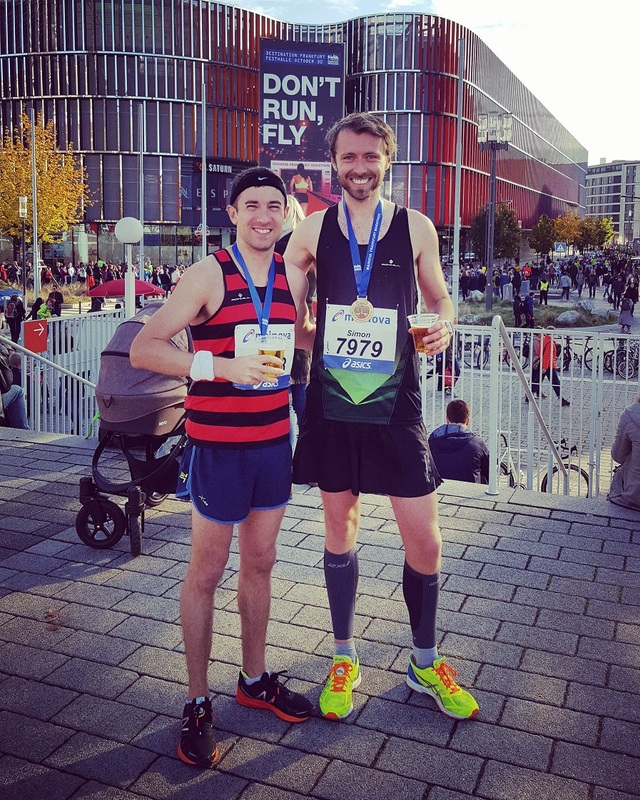 On the morning of the run, anything remotely near my previous PB would have been satisfactory and my only criteria was not to totally balls it up and go over 3 hours. The lactic acid build-up from that Red Bull Steeplechase race made my legs feel heavy for the next two weeks and, with that, utterly sank my confidence. Anyway, after a stress-free journey to the airport (and, by stress-free, I mean leaving home late and having a veeeery considerate Uber driver drive us at 85mph to the airport while my heart palpitations increased by the minute at the prospect of coughing up £400 for new flights – thank you Sir! 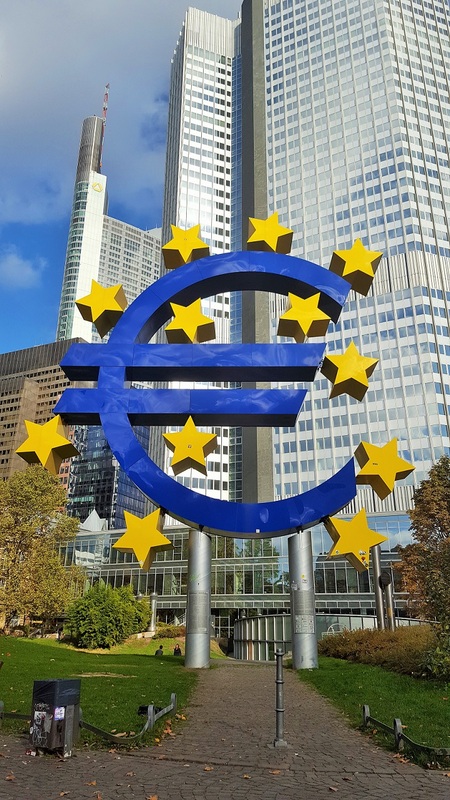 ), we were in Frankfurt. An unusually good goodie bag! 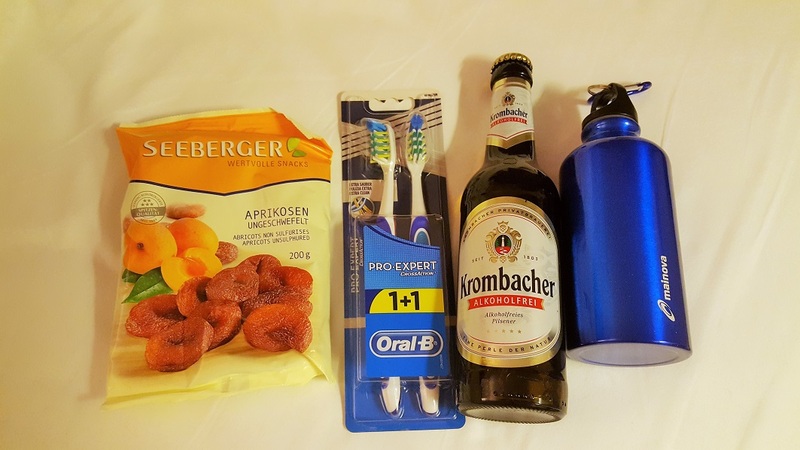 The expo was like many expos (queues, loads of tat you don’t need, a few freebies if you play stomach-roulette and dare touch the hand-outs handled by kids’ grubby fingers) although the goodie bag packed a few surprises: toothbrushes, dried apricots, a metal water bottle and… a bottle of beer. This was way better than the usual rubbish! I so should quit my job and become an artist. Right? After that, Pippa and I headed down to the expo’s hidden basement to…hand in my bottles for the race! Just like a pro. When I had signed up, I had put 2h44.59 as my target time: somewhat ambitious but, well, you never know… a 90mph tail wind, a shortcut, a lift in a car… anything is possible! Let’s just say the race seemed a long way away at the time. 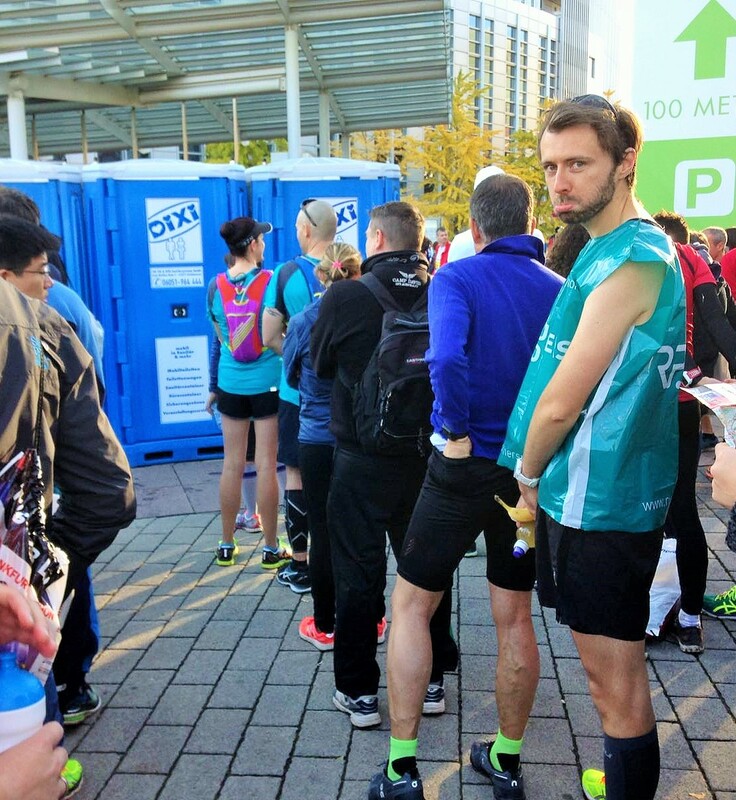 When I was reading through the pre-race info the day before the race, I noticed a small paragraph saying that all male athletes with target times sub 2h45 could drop off their bottles to be placed along the race for them. 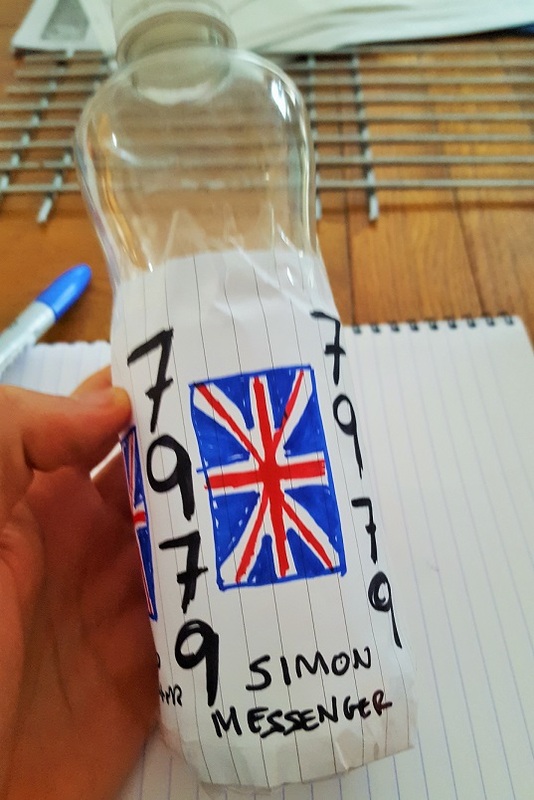 So, feeling a little smug, I dropped off my 2 – artistically covered with roughly drawn union jacks and my race number, bottles in the 20km and 30km boxes. At least I’d get to pretend to be a good athlete for a few minutes! So, back to race day. After an unusually late lie-in for a race day (‘til 7am… it wasn’t exactly luxurious), Alex Hobley – a fellow Herne Hill Harriers runner, Pippa and I headed down town. We jumped on a crammed bus (and of course paid our fare, hum hum) until we got off and I misdirected us for 10 minutes. 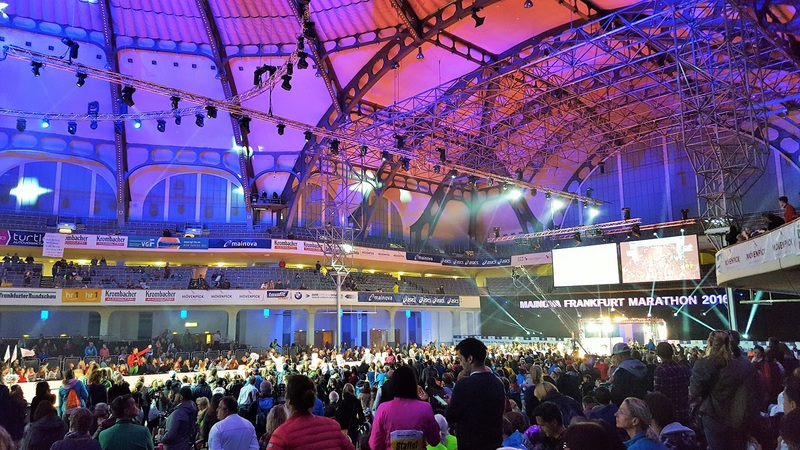 One kilometre later, we eventually got to the start line at the Festhalle Messe Hall, where the party music was pumping and the toilet’s queues growing. I joined the queue for my, erm, 7th poop of the day. What did I say earlier about mental confidence going out of the window? Actually, this was just normal race malarkey. And, on the plus side, I hadn’t felt this light in months! Next were the usual shenanigans of briefly warming up before standing in a cattle pen for 20 minutes cooling down. Someone spotted the bottle of home-made iskiate I was clutching and, probably slightly concerned by its content, checked that I wasn’t just drinking tadpole infested sewage water. I reassured him although he didn’t seem that impressed. 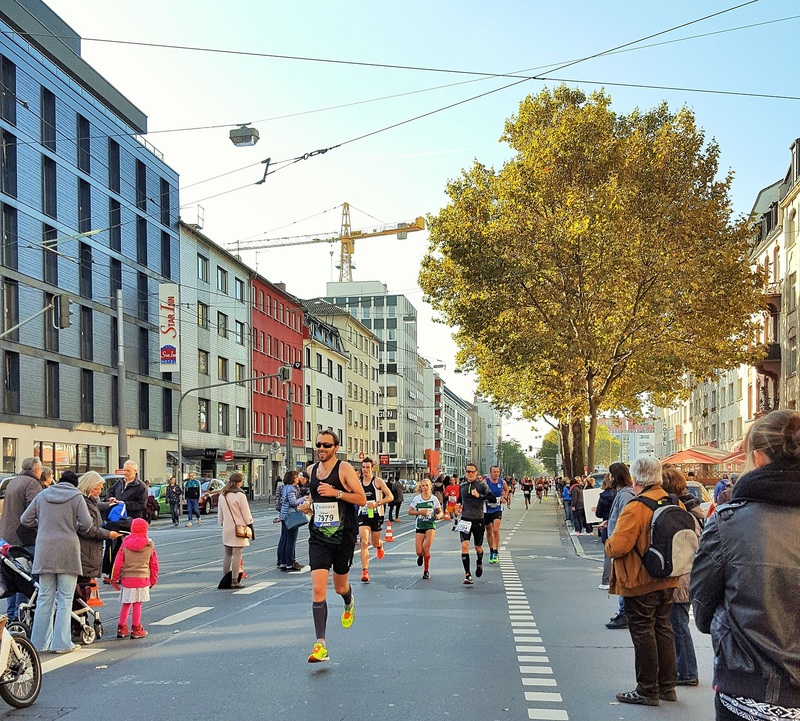 The first few kilometres were a bit of a labyrinthine zig-zag around Frankfurt’s Old Town and financial district. The Old Town wasn’t so old in reality as the Allies kindly blew it to smithereens in World War II. 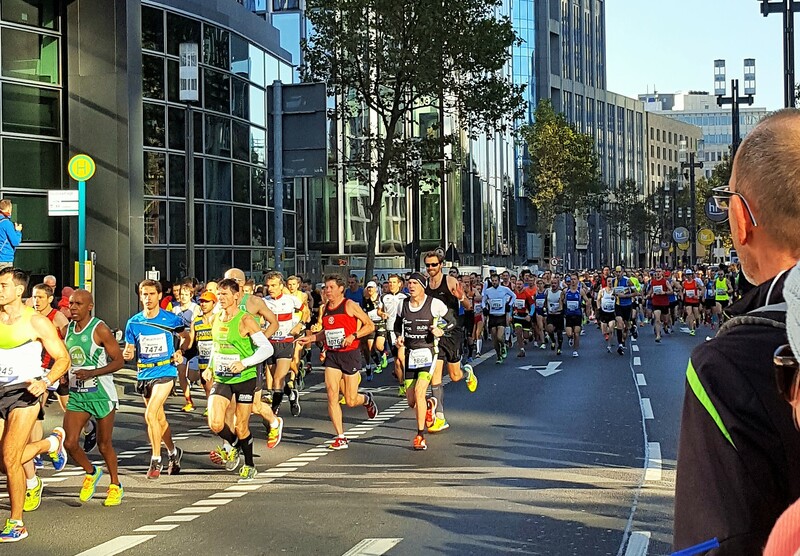 Instead, a sea of skyscrapers shot up in the sky and, for a lot of the race in the inner city, it felt a bit more like running in Canary Wharf than through a historical German city. The towers were causing my Garmin a bit of trouble while it struggled to pick up signal at times. At one point, I apparently ‘ran’ 200m in 24 seconds (2min/km! ): I think not… My race plan was fairly standard for my marathons: run the first half a few minutes slower than my half marathon PB and then try holding on to that pace for as long as possible. On a great day, that’d mean to the end; on a good day, ‘til 35km; on a normal day, ‘til 30-32km. So, for today, that meant I was aiming for 1h23 first half with as long as possible afterwards at (or near) 4 min/km. Any seconds ‘banked’ in the first half would help me stay on course in the second half when my legs fade away. 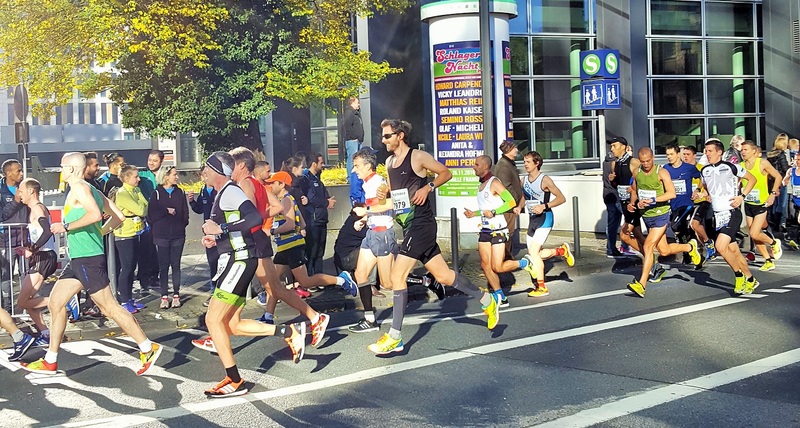 Despite the watch hopping in and out of world record mode and ‘joggeur du dimanche’ mode, I stuck to my race strategy surprisingly accurately and reached 5km in 19.39, 10km in 39.27, 15km in 59.05 and half way in 1h23.29. So far, so good. I realise it’s a meaningless analysis but … how straight is my leg?! In the meantime, Pippa was having her own little race around town and most likely set her own personal best for the number of times she saw me in a race. Thanks to all the early loops in the course, she saw me and Alex … 7 times! The course itself, well, isn’t very exciting. 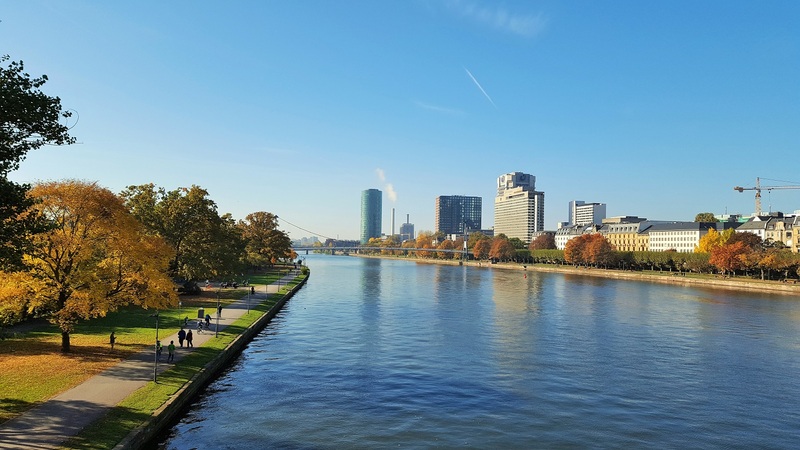 I’m sure Frankfurt has some really exciting and scenic areas but we didn’t get to witness many of them. I’m not sure why the city felt like it lacked much of a vibe/culture but it just did. 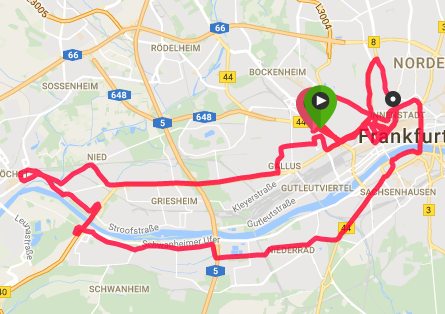 After 10km, the route crosses the river Main and, from then until roughly 35km in, it was pretty much exclusively suburbs and industrial estates. There was some decent, if somewhat patchy, support as you went around which got you through the most boring parts but very little visual stimuli for the vast majority of the course. 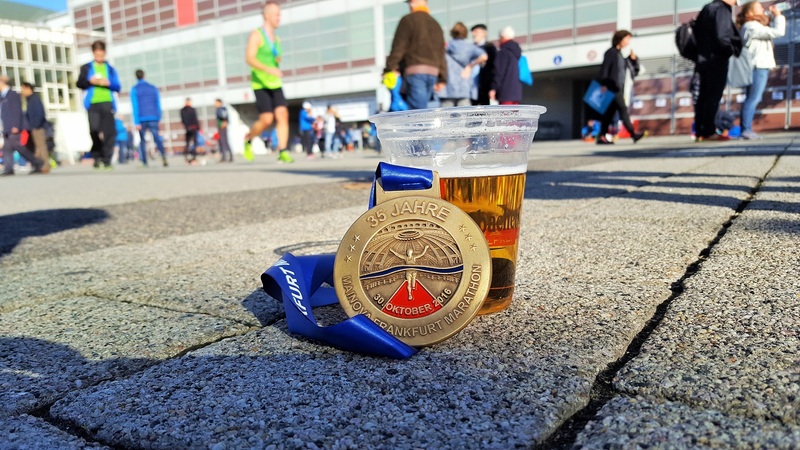 Like most marathons, the ‘true race’ started after the half way point. This is when months of training pay off, or months of slacking come back to bite. To me, the easiest mental way to get through the exercise is just to break it up in chunks. Rather than picture 21 more painful kilometres, I focus on maintaining my pace for just 5 more kilometres. Successfully repeat 4 times and you’re finished! 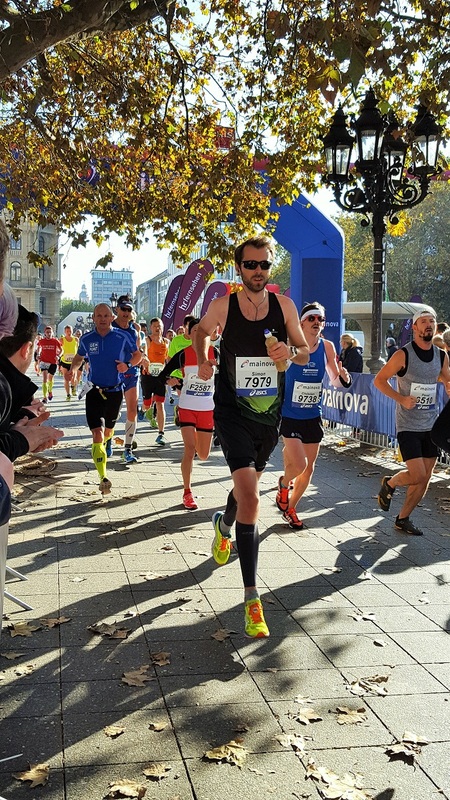 Easier said than done… The first few sub-targets went by relatively ok and I reached 30km in 2h00.11 – still on track for a sub 2h50 finish. At this point, “the wall” is never too far away even if its magnitude will vary and reflect your fitness/training levels. I got to 35km still relatively unscathed but, soon after, my legs tired and, despite my best efforts and trying to focus on my technique and not pain, it was hard to do much more than to just churn out step after step. 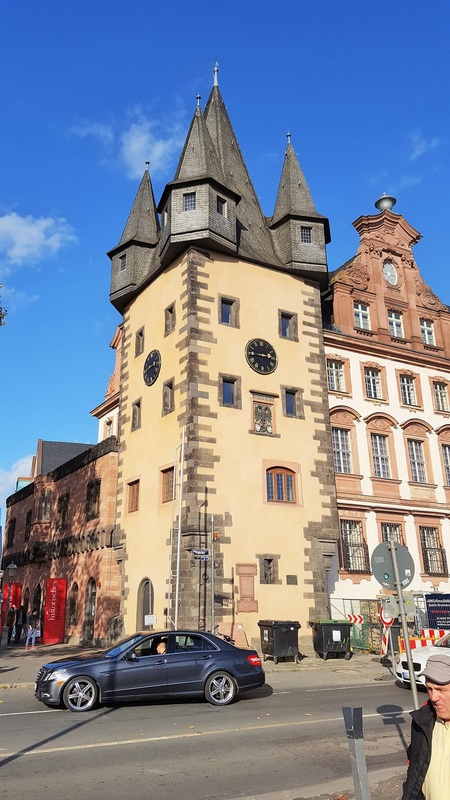 Some sort of tower in Frankfurt. You’re welcome for the cultural insight. I know. We were back in town by now and went through a much-cursed cobbled street for the third (?) time and past the St Paul’s Church – a fortress-like monument for the fourth and last time. Then, somehow, after 40km, my legs kicked back into action! Maybe I subconsciously knew it was almost over so could burn off any energy I had left. Regardless, I knocked off the last 2km at 4m10s/km pace and even the last 500m at 3m50s/km! After what felt like one last sprint but probably resembled more of a hobble, I was through in 2h52.44 – a good minute ahead of my PB! This only equated to an improvement of 1.5 seconds/km in 18 months but I’ll take it nonetheless! While I was elated at my last PB, I guess this one felt more like incremental progression than a milestone (like sub-3). If anything, I think I was more than anything else relieved to be able to justify the time and money spent on training and getting to this race! 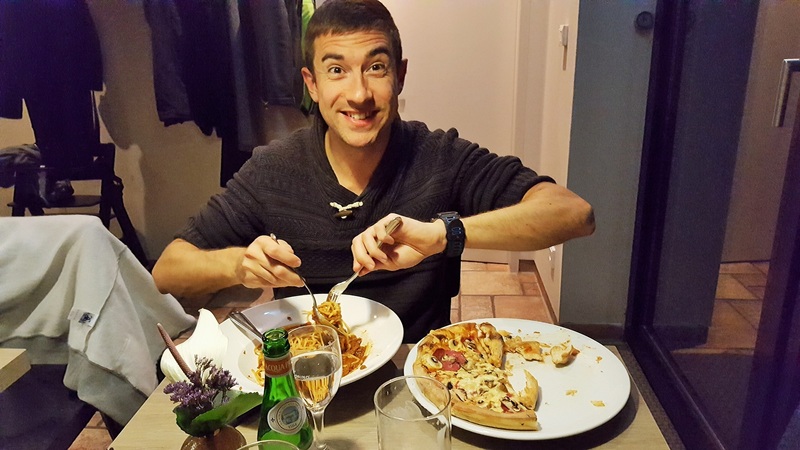 Just as I was finishing, Alex’s legs were totally caving in – he’d been on track for 2h55 for most of the race but a final few kilometres at 6min/km killed off any hope of a sub-3 marathon debut (“debut”: he’d previously done 2 before he took up running seriously). A much more seasoned short distance runner (and much faster than me), his words of wisdom were slightly better than Sean’s: “a rollercoaster of a day, it’s hard to summarise my emotions. I have a new respect for people who do marathons no matter how fast they are. Anyone willing to sign up and prepare for something this sustained deserves respect. Hands down, it’s the third one I’ve done and it hasn’t got any easier”. Right, 3 days off then back to the drawing board! Great recap. Thanks for sharing and congratulations on a PB. Any marathon PB is well deserved, they don’t come from anything but hard work so you should be very proud.